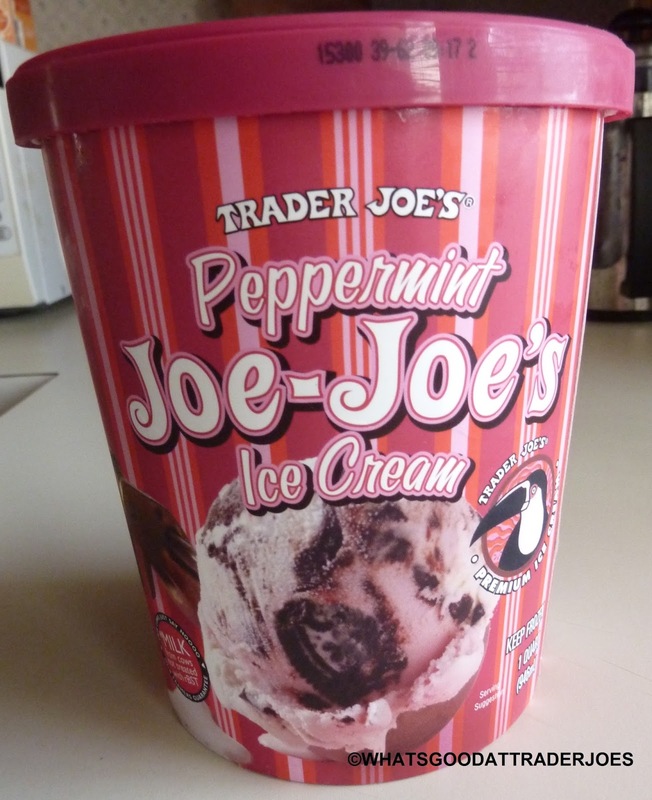 Yes, I have ventured back into the dangerous realm of reviewing frozen peppermint products just before Thanksgiving. Why exactly is it dangerous? I'm glad you asked. It's "dangerous" because I risk being lynched by the huge, uncompromising camp that will insist this is a Christmas product and should not be reviewed until after Turkey Day. While I understand where these folks are coming from, I must argue that it's not me that should bear the brunt of their indignation, but Trader Joe himself for offering this product so far ahead of the official Yuletide season. Furthermore, one should consider why, in the first place, peppermint must be associated solely with Noel and not any other holidays or seasons. I think at this point in our culture, Thanksgiving has been inextricably woven into the beginning of the Christmas season and should begin to reflect its standing as the kickoff of Pre-Advent and the full-contact shopping season. But that doesn't give us an excuse to skip over the giving thanks part. We should be thankful in all circumstances. And trust me, there is always something to be thankful for. So..there's that. Aaand there was also this incident...er, I mean post, two years ago about another peppermint product, the name of which I shan't even utter on here. It's a "please don't click that link" type of situation, indeed. But I know the more I tell you not to click it, the more you'll be inclined to do so anyway. The post was declared "immature," "particularly gratingly snarky," and "far from your best writing." One reader even stopped reading our blog because of it and stopped listening to the podcast at the mere mention of this most-horrific post! Well, Karen, I encourage you to come back and give us another chance—for Russ's posts, if not for mine. But, thankfully, history did not repeat itself. Here, we find a perfectly pleasant peppermint product completely free of gelatin and made with milk from cows not treated with rBST. Sound delicious already? It is. It's got swirls of pork-free pink peppermint ice cream and good old, classic cookies n' cream ice cream. And it's chock-full of large chunks of actual Candy Cane Joe-Joe's, a product so popular, it has its own Facebook fan page. I really like the blend they put together here. It's one of the best mint ice creams I've ever had—right up there with Bittersweet Mint from the dear old PSU creamery. Both Sonia and I are huge fanatics of cookies n' cream, and both of us agree that's the best part of this ice cream. Sonia thinks there's a little too much peppermint ice cream. I kind of agree, although I don't think the peppermint ice cream ruins the mix by any means, particularly if you're in the mood for mint. I wouldn't have been completely heartbroken had it been Candy Cane Joe-Joe's in cookies n' cream ice cream, with no peppermint ice cream up in there, but that's probably because I'm such a big fan of cookies n' cream. The only other negative I can think of is that they did sneak some carrageenan into this ice cream, unfortunately. 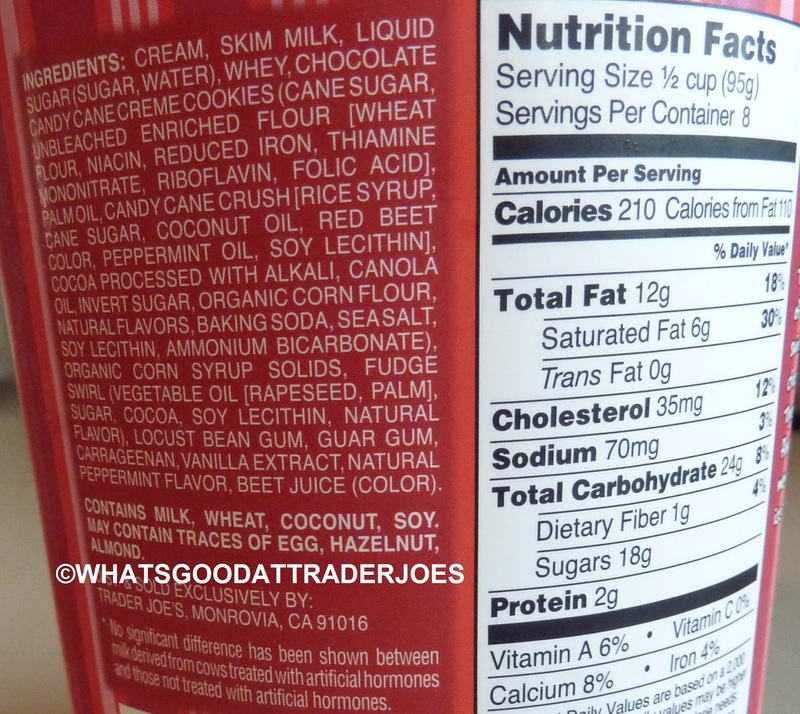 I realize there's a debate about just how harmful carrageenan is, if at all, but if I don't point it out, someone will call me out on it in the comments section below. 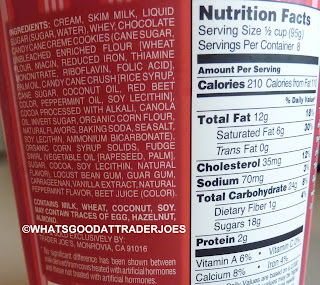 It's something I'd just as soon avoid if there were a carrageenan-free option readily available. But whether you save it for December or have it for dessert over Thanksgiving weekend, if you're into mint ice creams at all, I think this is a worthy purchase. I give it four stars. Sonia's gonna go with three and a half again. Happy Thanksgiving, and THANK YOU all for reading. It's funny this showed up on my FB feed today. I bought a container of this about a week ago and was really disappointed that the ice cream didn't have any discernable pieces of cookie in it, just flecks throughout. I chalked it up to a rare Trader Joe's fail. 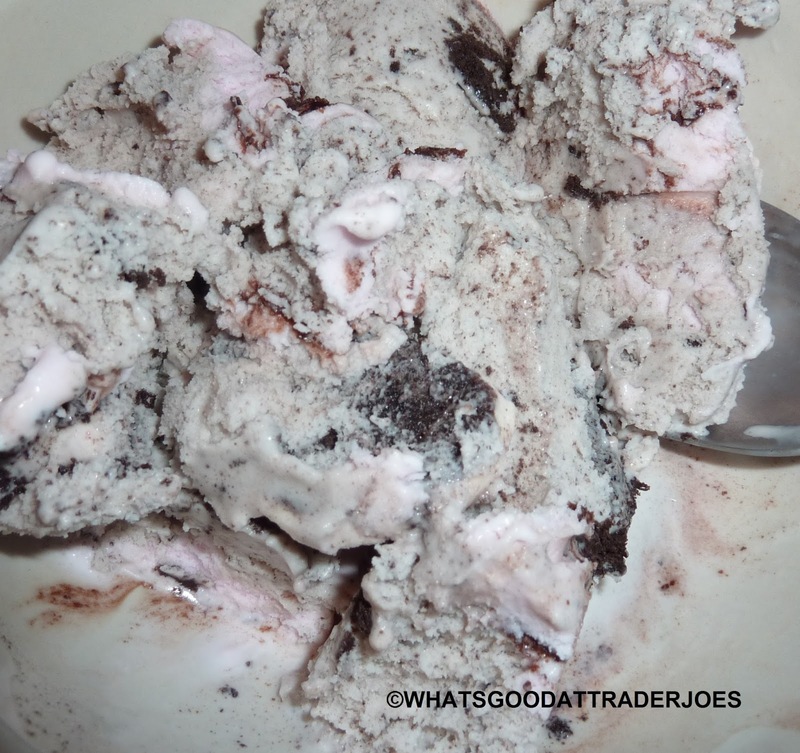 To me, cookies and cream shouldn't be "cookie powder and cream." Back to the other brands for me on this one. That's funny. Ours had huge pieces of cookies in it. A couple times I found what appeared to be an entire candy cane joe-joe. Apparently this product is inconsistent. Like Nancy, I had no cookies, except for one piece the size of my fingernail. Also no real peppermint flavor. Or even vanilla. Just tasted like "cold." I ended up dumping it down the drain (after melting enough to confirm the lack of cookies). Very disappointing. It looked like it would be ice cream perfection. I mentioned it to a store clerk next time I was in and they gave me a refund even though I didn't have the product with me, or the receipt! Their cs is fantastic. And I did buy the cookies, which are just as amazing as I'd heard. tons of fudge veining throughout my ice cream. Yum! Oh yes, that's an enjoyable ice cream (and I got cookie chunks!) You can really discern all the flavors, mm.